When you are in the garage (ie not in the car) there are up to six different screens to help you learn about your current session. The three bar menu icon at the top right displays a drop down that allows you to switch between screens. 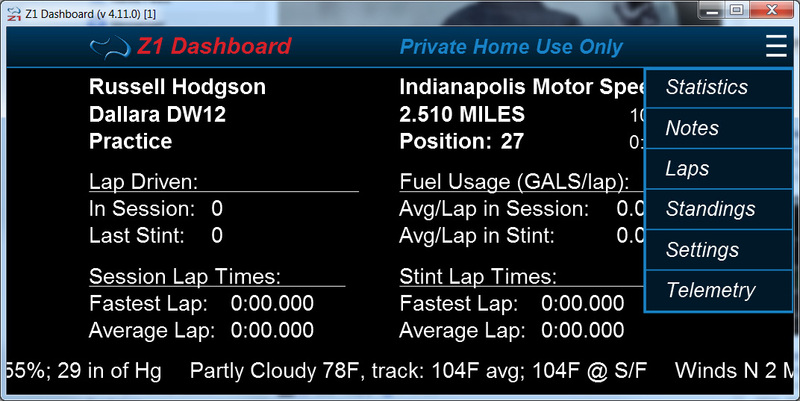 Statistics Screen: This screen shows your name, car type, track name and length, and session type. The screen goes on to summarize your current session, with session and stint lap times, both average and fastest. It also shows fuel consumption per lap for the session and stint; the number of laps driven in the session and stint, and your overall position. For those sims that support it, weather information is also displayed. Notes screen: This screen shows user defined text that would be useful to have on hand. 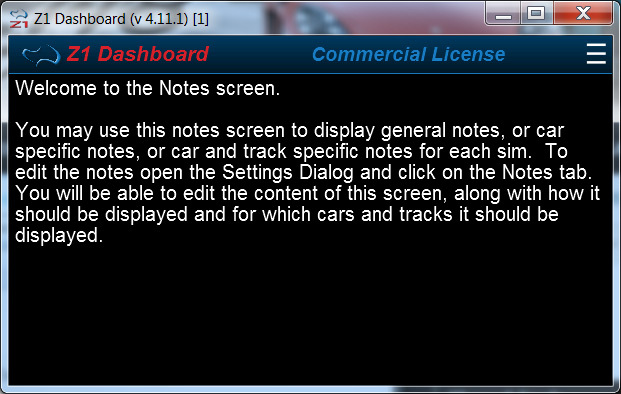 Each car and track combination can have its own set of notes. See full details in the manual. Lap Times screen: This screen shows all of your lap times from the current session along with fastest sector information, in and out laps. Also displayed is information about the number of laps available in the Z1 Analyzer along with the time of the fastest lap for the car and track you are driving. This makes it easy to see the laps you can compare your self against. Standings screen: This screen shows the standings from the current session, with each driver's name, lap time, difference to fastest lap and the number of laps completed. In addition the type of car and the car class is displayed. When driving in iRacing the driver's iRating and safety rating are also displayed along with the average iRating of all drivers in the session. 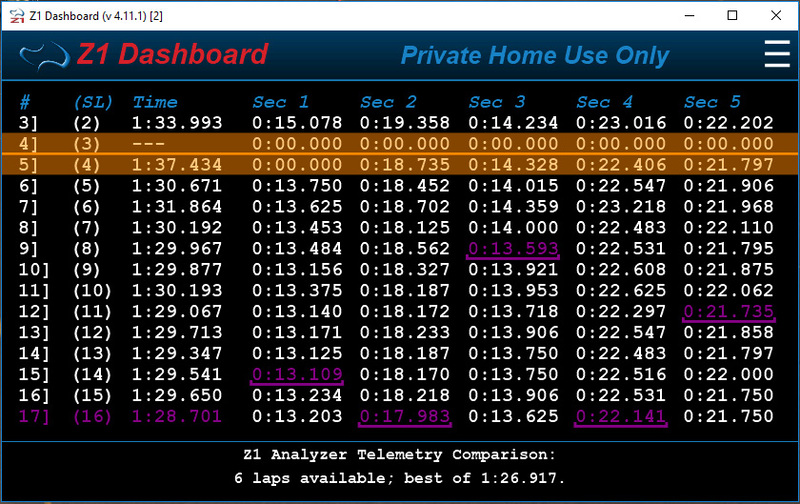 As with the lap screen information about the number of laps available in the Z1 Analyzer along with the time of the fastest lap for the car and track you are driving is displayed. 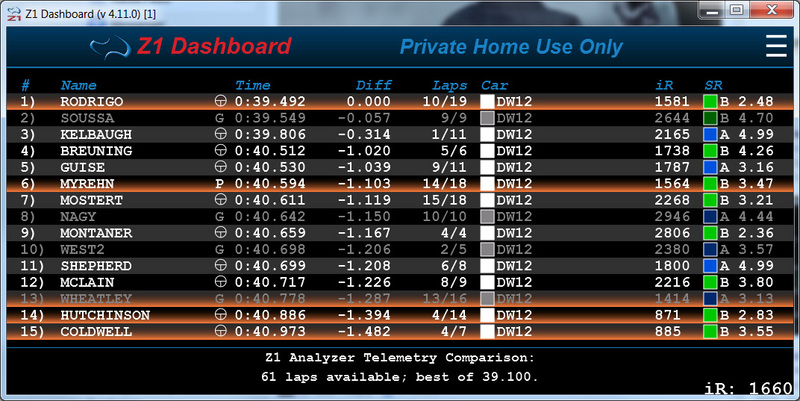 This makes it easy to see the laps you can compare your self against. Telemetry screen: This screen allows you to select a pre-recorded telemetry lap file, sync the sim's replay with the display's replay, and then play back the telemetry in real time, viewing tire temperatures, ride heights, shock deflections, g-forces, speed, rpms, gear, and throttle and brake application. (For iRacing only). Note there is also a live telemetry dashboard available for all sims.